As the wealth of information and content available online continues to grow at a rapid pace, the environment becomes increasingly difficult for people to navigate. Also, the challenge for online content providers is to ensure their best information assets are being found by their target buyers. Savvy marketers are already utilizing the mobile channel to reach their key target stakeholders online. Why now? Smartphones and media tablets are already mainstream devices that are increasingly being used for the search and discovery of online information -- often just-in-time to make purchase decisions. Juniper Research has revealed that by 2018, the total advertising spend on mobile search and discovery will reach $16.8 billion -- that's up from an estimated $6.4 billion in 2013. According to Juniper's latest global market assessment, while mobile web search will continue to account for the majority share of advertising spend, ads in local search applications will be the fastest growing market segment. Moreover, the more progressive companies will utilize content marketing and advanced SEO practices to make their information available and rank highly in organic search results -- rather than just rely upon paid advertisements. Juniper believes that growth in local app advertising spend is being fueled by improvements to, and wider deployments of, location-based technologies such as GPS and smartphone map apps. They argue that this makes it easier for advertisers to target nearby users, who are typically further along the purchase funnel if they are performing a local search. Augmented Reality Search, a subset of local search, will also see strong growth as awareness of the technology grows, albeit from a very small base. Nevertheless, optimization for mobile devices remains a key concern for users, search engine application developers and advertisers alike. The market study highlighted the issue where potential conversions have been frustrated by sites which are ill-equipped for mobile browsing or online purchase. It stressed that not only is the mobile advertising then wasted, but that a single poor experience can cause a brand or retailer to lose a customer to a competitor. That's why more marketers are converting their site to a responsive web design -- one that adapts to the screen size of the users device and thereby improving the viewing experience. That's also why developer talent with proven mobile channel skills are in such high demand. 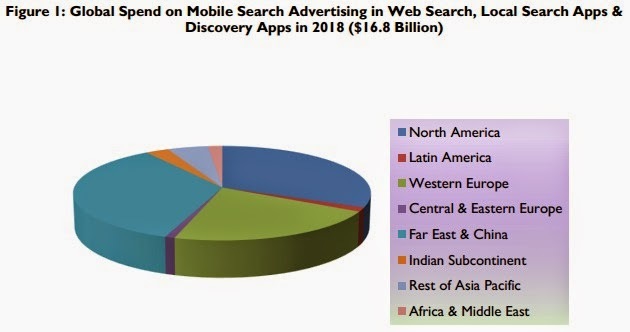 North America recognized the greatest advertising spend on mobile search in 2013, however it will be surpassed by the Far East and China in 2018. Both search engines and device manufacturers will work to develop natural language search solutions, leading to increased usage of intelligent personal assistants such as Apple Siri.